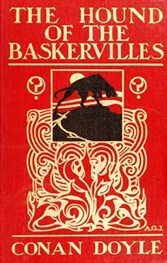 Originally published as a serial in The Strand Magazine from August 1901 to April 1902, The Hound of the Baskervilles was first published as a novel in 1902. Considered by many to be Sir Arthur Conan Doyle’s best novel, The Hound of the Baskervilles presents Sherlock Holmes in the midst of a case involving a mysterious death and a terrible family legend about a ghostly hound on the menacing moor. Sir Arthur Conan Doyle (1859-1930) was the author of four Sherlock Holmes novels—A Study in Scarlet, The Sign of the Four, The Hound of the Baskervilles, and The Valley of Fear—as well as 56 short stories about Sherlock Holmes. 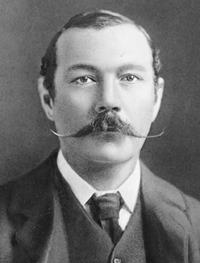 Although he worked as a physician and wrote dozens of non-series books, Conan Doyle is best remembered as the writer who created the timeless Holmes. This month Inclusion Movie Night features a Sherlock Holmes classic and everyone is invited! Free popcorn and other refreshments make the evening a complete treat. Inclusion Movie Night is presented monthly at the Library for teens and young adults of all abilities—and their families and friends. Registration is not required. The Hound of the Baskervilles is Sir Arthur Conan Doyle's most famous adventure featuring Sherlock Holmes. Written after Doyle supposedly killed Holmes in a titanic struggle with Professor Moriarty at the Reichenbach Falls, The Hound invites all manner of conversation and speculation as to its creation and enduring appeal. Tim Johnson, curator of the world's largest collection of Sherlockiana at the University of Minnesota, will explore some of the many facets surrounding this tale. The program is co-sponsored by the Batavia Public Library Foundation. Registration is required. Watch the classic 1959 Terence Fisher film starring Peter Cushing as Sherlock Holmes and Christopher Lee as Sir Henry. No registration required. Those Were the Days Radio Players West perform the Sherlock Holmes short stories “The Speckled Band” and “A Scandal in Bohemia.” Original scripts from the radio performances of 1945, complete with sound effects and original music, will be featured. Registration is required.